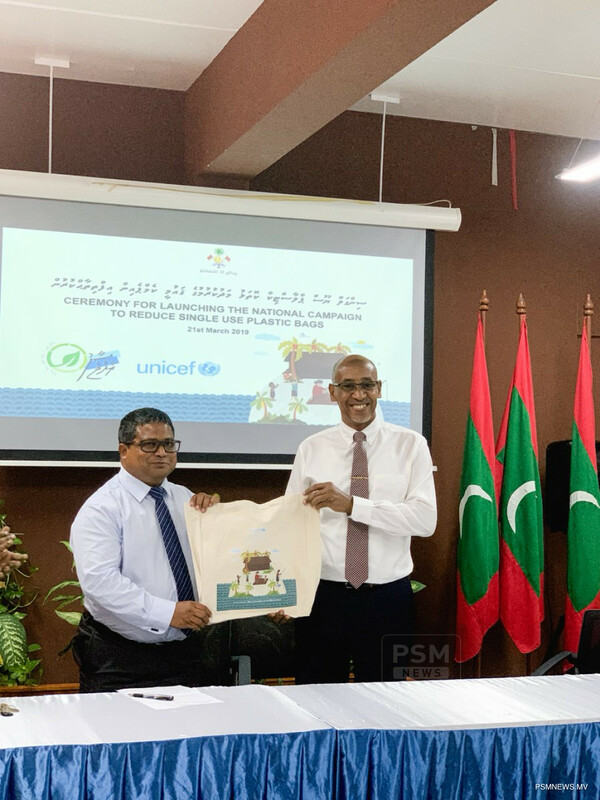 Minister of Environment Dr. Hussain Rasheed Hassan has called to stop dumping plastics into the ocean, which if not completely stopped may cause long-lasting damages to the delicate environment. Addressing the function held to launch the national campaign to reduce single-use plastic bags, Environment Minister Hussain Rasheed highlighted the biggest fear and harm to the reefs, lagoons, oceans and its belongings is plastic. Highlighting plastic is used in almost all households, the environment minister noted the negative health impacts of plastic. In this regard, he appealed to use alternatives to plastic and reduce the usage of single-use plastic. Noting every plastic piece, whether large or small will cause major destruction to the oceans, the minister said one major issue faced nowadays is plastic being found in the fish that are caught. He expressed while the whole eco-system and the food chain are connected, it will cause direct or indirect impact to the health of humans. He revealed efforts are underway to completely ban plastics in Maldives.